Here's where I'm going to be tomorrow. If you're smart, like to have a good time, and want to support Off-Off Broadway theatre, you'll be there, too. Join us for drinks, East Asian fare, a scintillating auction and of course the New York Neo-Futurists doing what we do best: performing live theater for you! 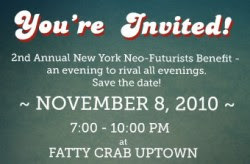 *New York Neo-Futurists is a 501(c)3 organization. All contributions are tax-deductible to the extent provided by law. A copy of the latest annual report filed by the New York Neo-Futurists may be obtained upon request from the New York State Department of Law, Charities Bureau, 120 Broadway, New York, NY 10271, or from the New York Neo-Futurists, c/o Rob Neill, Managing Director, 475 W. 57th St #6A-3, New York, NY 10019.